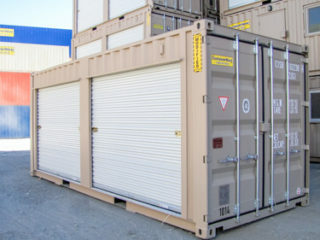 Container with Roll-Up Doors | ContainerWest Manufacturing Ltd. These units are perfect for storing items you need regular access to. Roll-ups are easier to open than container doors and provide convenient access to almost the full length of the storage area. Roll-ups are also popular with self-storage facilities, and with industrial sites where heavy storage items are moved using a forklift.